It didn't take much of an increase in oil prices to get shale oil drillers back to work in the U.S.
After spending much of 2016 near multiyear lows, oil prices began to rally in late November as it became clear that OPEC would finally cut production to address a long-standing oil glut. On Nov. 30, the cartel officially announced that its members would cut their production by 1.2 million barrels per day, while non-OPEC members would reduce production by an additional 600,000 barrels per day. However, the uptick in oil prices may prove short-lived. That's because even the relatively modest oil price recovery of the past year is driving a quick rebound in U.S. oil production. U.S. oil production is bouncing back quickly. Image source: Getty Images. In the past, OPEC's attempts to manage oil prices have often been undermined by "cheating" within the cartel. As some members cut output, prices typically rise, giving other countries an incentive to make some extra money by exceeding their production quotas. However, compliance has been quite good this time around. Estimates of the compliance rate vary, but OPEC says that the parties to the recent agreement implemented 94% of their pledged production cuts by February. OPEC members actually exceeded their targeted cuts, partially offsetting a 64% compliance rate among non-members. The initial news about OPEC's planned cuts caused the price of Brent crude oil to soar from less than $4 per barrel to more than $52. As reports about the strong compliance rates began to filter out in early 2017, prices moved even higher. Brent crude peaked above $56 per barrel last month. However, it's been all downhill in March. The first issue that has dragged oil prices down is that U.S. inventories have continued to rise year to date. As of March 10 -- the most recent date for which data is available -- commercial crude oil inventories in the U.S. totaled 528.2 million barrels, up from 492.2 million barrels a year earlier and 479.0 million barrels at the end of 2016. Some of this increase is related to seasonal factors. The first quarter of the year is a low-demand period. Additionally, refineries tend to reduce their oil stocks at the end of each year for tax reasons. Nevertheless, the evidence clearly shows that there is no shortage of oil right now. A second factor behind the recent decline in oil prices is that U.S. production has rebounded at a remarkable rate. Two years ago, analysts assumed that oil prices below $60 would cause a huge decline in shale oil production. The reality has been quite different. U.S. crude oil production did fall somewhat as it became clear that the late-2014 plunge in oil prices wouldn't be reversed quickly. Production peaked in mid-2015 and fell by more than 1 million barrels per day by mid-2016. 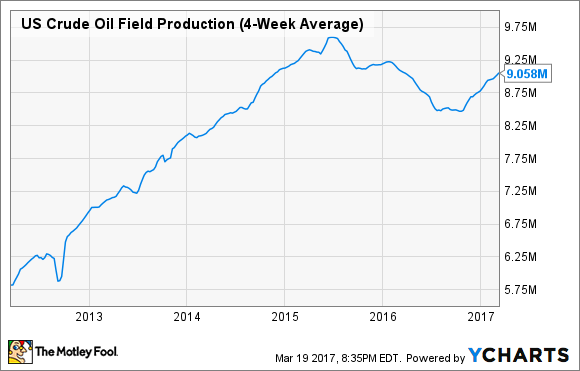 US Crude Oil Field Production (4-Week Average), data by YCharts. However, domestic production began to stabilize as oil prices approached the $50-per-barrel mark last year. Since the first week of August, U.S. output has surged from 8.45 million barrels per day to 9.11 million barrels per day. For the past few weeks, production has been up on a year-over-year basis for the first time in more than a year. 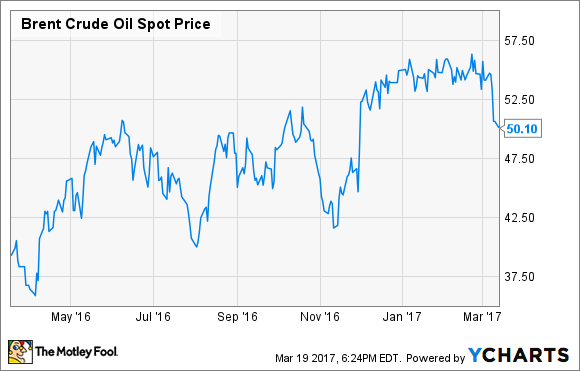 Looking ahead, nimble U.S. oil companies seem likely to keep raising output, even if oil prices remain near today's level. 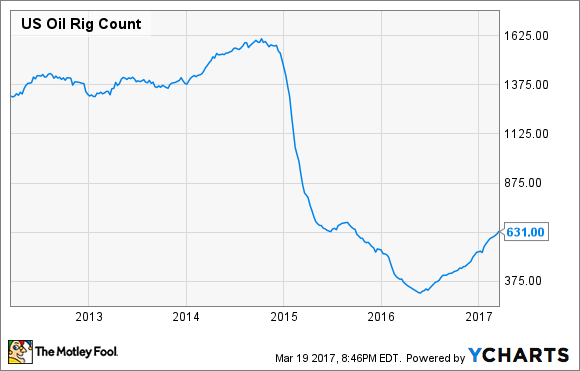 The number of oil rigs drilling in the U.S has been rising at a steady rate. While the number of active rigs is still well below the highs of a few years ago, the rig count has already doubled compared to last year's low. Oil companies have dramatically reduced their costs in the past two years or so. There's some debate about how much of their cost savings come from productivity increases, compared to squeezing suppliers or shutting down in less profitable regions. That said, it appears that there are still opportunities left in the best parts of the U.S. shale oil patch. Furthermore, costs were artificially inflated a few years ago due to shortages of personnel and equipment. If global economic growth improves going forward and OPEC continues to limit production (in conjunction with some other major producers), oil prices could certainly move higher. But shale oil companies' cost-cutting efforts of the past few years virtually ensure that we won't see a return to $100-per-barrel oil in the next few years.